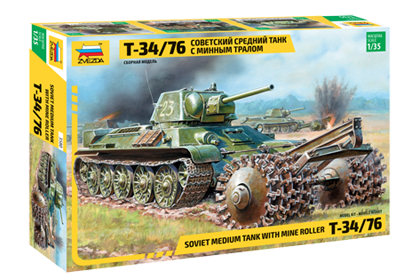 This is the Zvezda 3580 kit in 1/35 scale, of the ‘Russian Tank T-34/76, with mine roller’. Fighting with mine barriers became one of the major problems of the Red Army attacks during WWII. The supreme command ordered urgently the development of a mine clearing device. At that time the T-34 and its variants were the most widely used tanks in the Soviet Army. So it was logical to adapt the T-34 as carrier. This combination was then successfully in service through the whole WWII. This entry was posted in Kits, Stash and tagged 1/35, 3580, medium tank, mine roller, russian, t-34, t-34/76, zvezda by Thomas. Bookmark the permalink.